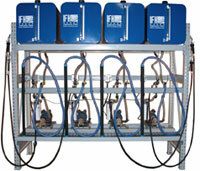 Ford & Ulrich offers a variety of products that focus on the needs and requirements of each customer’s physical plant. The diverse manufacturers that we represent have given us the experience in a full arsenal of products geared towards the solution of unique facility needs. Equipment requirements including drum handling, flammable storage cabinets, hand trucks, rolling ladders and modular offices can all be accommodated within the customer’s facilities with the ingenuity and support products available from Ford & Ulrich.